Your website is a reflection of your business! 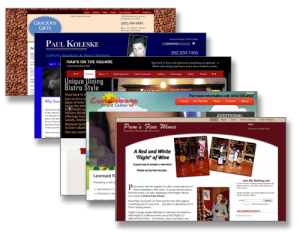 An effective Internet presence begins with a great Website Design. Users draw conclusions about the quality of your company within a few seconds of visiting your website. Having an attractive design is essential to your success. A website designed from the ground up can incorporate all the important elements necessary for traffic and conversion such as layout, SEO and web analytics. Conversion optimization becomes easier when we design your site since we can control the “look and feel” and work our conversion strategy into your Internet marketing plan from the beginning. Our programmers follow all website design and search engine optimization best practices to ensure that your site has high visibility from the beginning. When we talk about a ‘Highly Visible Website’ this is what we are referring to. We are continually evolving and improving our website programming methods to make sure the technologies we use are always the most effective for the job. In addition to the graphic design, we have extensive experience building interactive features into your website and data-driven websites have been a specialty of ours for years. For more information on our Website Design services, please call 262-662-9667 or fill out the form below.